A black lab lived up to his name - retrieving his two best friends who were stuck in a runaway canoe in a fast moving river. We know dogs can be heroes who will risk their own lives to save others, but this harrowing scene caught on video puts it all into perspective. 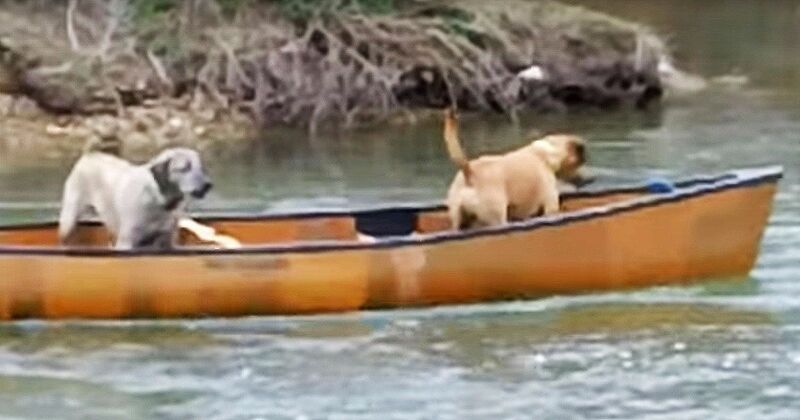 In the viral video you can see the two dogs stranded in the canoe that starts moving down stream. The dogs begin to panic, but while their owner is trying to keep them calm the black lab decides to take matters into his own paws - jumping right into the rushing water to save his friends. The black lab swims upstream, then grabs ahold of the rope in the front of the canoe and drags it to shore. Their owner standing by with words of encouragement, "Keep going, boy! Bring him home." When the pups reach shore they happily jump out of the canoe and start prancing around. A very happy scene after what could have been a very dangerous situation. Check out the incredible video below to see the entire rescue in action.